There’s a price for every product and a product for every price, and in few areas is that more true than in welted boots. From the $50 plastic welt all the way to the $5000 hand lasted masterpiece, each level of footwear has its own set of merits and drawbacks. In this post, we’d like to break down the many footwear brands and models into three distinct categories of entry-level, mid-level, and end-level boots and shoes that each have their own price points and characteristics. We hope laying some of the groundwork will help you decide what the right pair for your interests and budget as well as get a better picture of what’s out there. For those “in the know”, be aware that these are broad categories and that there are exceptions to every rule. Also, these groups aren’t categorically better or worse than each other, just different, although your wallet might disagree. I know, something that costs up to half a month’s rent could hardly be considered entry level, but these are still shoes that could last you over a decade if cared for properly. If you’ve never owned a pair of welted shoes before and want to see what that sweet break-in process is like, you should start here. What you’ll find in this category are generally Goodyear and Blake welted options with varying levels of natural materials. Some will have cork filling and a full leather plug sole, some will have full foam and EVA. Most will have a shank, although many will use fiberglass in place of metal. Leathers you can expect here include calfskin on the dress shoes and various pull-up leathers (including Chromexcel) and the occasional roughout on the boots. Thorogood 6-Inch Moc Toe Boots. Image via Rakuten. Tanning and construction for some brands will be done in the US or Europe, but many Southeast Asian brands have mastered entry level construction as well. Our top pick for at this level is the Red Wing Iron Ranger, which sells for $320 at Nordstroms (see our full review). Other great options include the Chippewa Service Boot, LL Bean’s Engineer Boot, and the Thorogood 6″ Moc Toe. 3sixteen x Viberg collab from Fall 2016. As we go up the ladder, the leathers get more exotic, the constructions more detailed, and the options abound. It’s kind of hard to go wrong at this level, boots in this level are generally made in smaller batches by smaller brands and you can expect incredible attention to detail and very high construction quality. Paraboot’s Michael shoe is constructed with a Norwegian welt construction. Image via Rakuten. Welting can also get more interesting, with some brands opting for more intensive methods like Norwegian welts, storm welts, or even some hand stitch welting. This is also where you’ll first spot leathers like shell cordovan (although at the upper end of the spectrum) and get other materials like kudu, calfskin, or the occasional veg tan boot. Alden Stoneman chukka boot in black shell cordovan. Image via Unionmade. You’ll also have a little more variation in fit, these brands tend to work with many different lasts (the foot shaped model used to make the shoe) that can accommodate a wider range of foot shapes. Role Club Engineer Boots in black. This is where interest becomes obsession and there’s a split between the makers under contract to produce footwear for a royal family…and those who dream about the world’s perfect engineer boot. Vass wingtip shoes. Image via Blue Loafers. Hiro Yanagimachi. Image via Leffot. The former is most often found in the UK and the latter in Japan and California. Regardless, the construction is superlative, the leathers likely proprietary, and many offer the option to go fully bespoke with custom fittings. 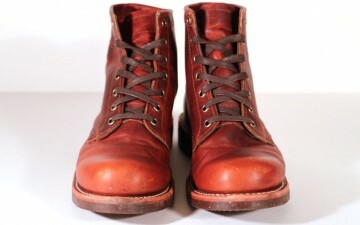 Mister Freedom Road Champs, well worn by Vintage Engineer Boots. Spend some time thinking these ones over before spending your money.